If you’re a fan of retired cop Lt. Joe Kenda, this Investigation Discovery Giveaway is for you! This Christmas, tune in to ID and watch the Homicide Hunter Marathon starting at 6a/5c. Then, enter A Very Kenda Christmas Giveaway at InvestigationDiscovery.com/Giveaway and you could win big! Big like in $5,000 BIG. Commencing at 6:00 a.m. on Saturday, December 24, spot the hourly code that will be displayed onscreen through 6:00 a.m. on Monday, December 26. This means you’ll have the opportunity to watch 49 of the best Homicide Hunter episodes so keep watching for a new chance to win every hour. 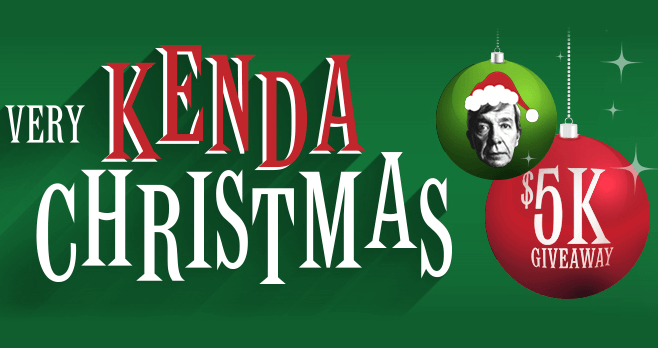 Good luck and have a Very Kenda Christmas! For your chance to win the Investigation Discovery A Very Kenda Christmas $5K Giveaway, you’ll need to look for codes displayed at various times during the Homicide Hunter Marathon. Investigation Discovery will reveal a total of 49 Hourly Codes during the Promotion Period and you’ll be able to find them all right here. Come back every hour for the latest code. After you learned the on-screen code, head to InvestigationDiscovery.com/Giveaway and complete the registration form including the correct code for the applicable hour. You’ll also be required to provide your personal contact information like your full name, completing mailing address, and phone number. Each correct code will result in one Entry into the Giveaway, up to a maximum of 49 Total Entries (one entry per hour), during the Promotion Period. All entries must be submitted between 6:00 a.m. ET on December 24, 2017 and 6:00 a.m. ET on December 26, 2017 to be eligible for the Grand Prize Drawing. Open only to legal residents of the 50 United States and the District of Columbia, who are at least 18 years of age or older at time of entry. Runs from 6:00 a.m. ET on December 24, 2017 through 6:00 a.m. ET on December 26, 2017. You may enter the Sweepstakes multiple times. Sponsor will conduct a random drawing from among all eligible entries received during the Entry Period, on or about January 2, 2018. This Giveaway is being sponsored by Discovery Communications, LLC, One Discovery Place, Silver Spring, MD 20910. For more information on the A Very Kenda Christmas Giveaway, including official rules, visit www.investigationdiscovery.com/giveaway now! Santa, thanks for the chance to win. Love great storyteller Joe Kenda. I love Joe Kenda, have probably watched all his reruns. Like the new ones too. Thanks for the chance to win~~~ MERRY CHRISTMAS!!! & I live in Colorado Springs. hey anybody know when I’m going to get my $5000?I just need to find out????? ?MERRY CHRISTMAS ???? TO Y’ALL FROM LOUISVILLE KY, we had a little SNOW on the ground this morning, first time in awhile?? TREE or SNOW, your guide shows 1 hour off.